Old Valley Farm is a local nursery that has been growing perennials and companion plants for more than twenty years in the Treasure Valley. Having worked with the more than 1500 different varieties for that amount of time, we have selected truly hardy varieties that have proven themselves tough and reliable in our unpredictable and challenging climate. Our efforts translate to a better product for you our customer, as well as a confidence in the plant you are planting, knowing it is going to thrive in your garden environment. We have many unique challenges here in the Intermountain west that other gardeners don’t have to be concerned with. Challenges like variable soils that tend to be high in pH, unpredictable temperatures at times, and variable precipitation amounts. Although these challenges confront us, we can still be successful in overcoming them. Below are listed some of the most common issues we face and suggestions on how to overcome them. Be sure to check the roots! Your new plants should have a healthy root system throughout the root ball. The roots should be light in color to bright white, depending on the variety of plant you are planting. You should not see dark colored, soggy, or mushy roots in large quantities. This usually indicates a potential disease problem and/or a root system that is weakened due to overwatering. You should also look for varieties that are hardy in our climate or growing zone. Plant hardiness zones are established by the USDA to help gardeners and growers determine whether a plant will be prone to survival with the average minimum temperatures recorded in a given part of North America; for more information on Hardiness Zones, please refer to the following website: www.usna.usda.gov/Hardzone/ushzmap.html. In the Boise area, we typically associate with a zone 5 which reports minimum temperatures -10F to -20F. Know your exposure! Know whether or not the plants you like are going to grow in the amount of sunlight you can offer them. This means that you want to identify approximately how much direct sun the planting area will receive to ensure a proper match for plants that will thrive in that exposure. Note that there is a difference between morning (sunrise to mid-day) direct sun and afternoon (mid-day to dusk) direct sun. The morning sun is typically less intense and less stressful on plants than the afternoon direct sun can be. Once you have chosen the right plants for the right place, the soil should be prepared properly and your plants planted properly to ensure a healthy, vigorous start. This part can be very challenging due to the varying soil conditions across the valley. Some gardeners experience very loose draining, sandy soils that lack organic material and any moisture or nutrient holding capacity. For others, (probably most of us) we get heavy clay soils that drain very poorly, and actually hold too much moisture and often times bind up nutrients and prevent them from being absorbed by the roots of your plants. These clay soils also tend to be alkaline in pH reaction as well. The best and really only thing you can do to correct a poor soil structure (structure refers to the proportion of sand, silt and clay present in the soil) condition is add organic matter. This is usually in the form of compost. Some people will also add Gypsum to severe clay conditions to help in two ways: the first being to lower the pH of the soil and the other to flocculate the very fine clay particles, loosening them up so they don’t continue to lay flat on top of one-another. The best thing to do is take a composite sample (collection of small samples with a clean trowel, from different spots in your landscape) of the soil from your planting area down to your local University Extension office where they can run an analysis for you and tell you what type of soil structure you have; often times they’ll also give detailed recommendations for your specific situation. At the very least, add some organic compost or planting mix blended with the soil excavated from your planting hole, a little slow release fertilizer (i.e. Osmocote) per the recommended rates and backfill around your newly planted plant with this blend. Typically a blend of 1/3 compost/planting mix is mixed with 2/3 native soil to backfill. In severe situations, consider planting your plants a little high than the natural soil grade; approximately 1-11/2” above. When doing this it will be critical to include a 2-3 inch layer of composted mulch, or bark mulch to maintain moisture around the top part of your plant. This technique also has another benefit though, that is over time this mulch layer will decompose releasing nutrients to the soil, as well as raising your soil level slightly and creating a whole new layer (or horizon) that is often completely non-existent in our growing region; the organic or “A” horizon. It is important to always deep water your new plants in after you have finished planting them. This helps to remove any air pockets around the roots, and establishes a reservoir of water available to the plant as it begins to push its new roots into the surrounding soil. Develop or install some sort of system that delivers water to your new plants (and established ones too) consistently and evenly. Automatic irrigation systems are great for this, but in our sometimes unpredictable weather conditions require constant adjustment to be sure you are delivering the right amount of water to meet the plant’s ongoing needs. The best way to check if the plant needs water is to pull some of the bark or mulch away from the plant and see if the first 1-2” of soil has dried slightly. At this point you are ready to re-hydrate the planting. 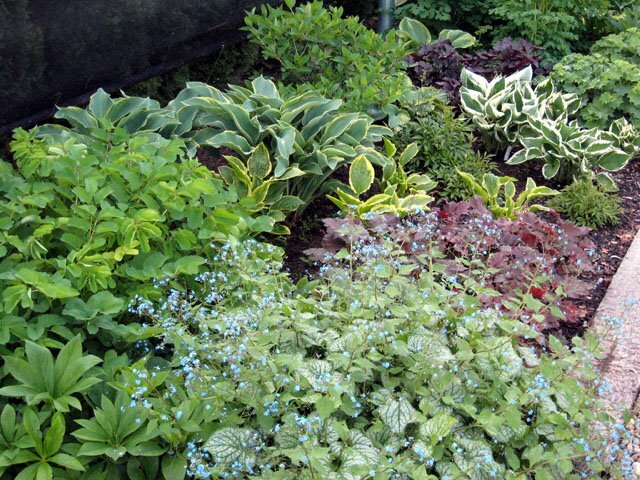 Most perennials prefer a deep soaking and then a chance to dry out slightly between irrigation cycles vs. receiving constant irrigation cycles. An organic mulch is very important to our landscape’s health here in our typically dry and poor soil climate. As briefly described above, organic mulches provide several benefits. They over time will help to improve soil structure by helping to create an organic layer or horizon in the soil profile. This is important because this is typically the most efficient layer of our soil in terms of moisture retention and nutrient exchange potential. In addition to the above mentioned benefits, mulch helps to retain moisture during the summer months when conditions are hot and dry. It will also provide an insulating layer during winter months to help borderline hardy varieties over-winter more successfully. A word of caution though about this is that if the mulch layer is too fine, it actually can hold too much moisture around the crown of perennials during winter months and rot them out instead of protecting them. Trying new things is one of the fun things about gardening; however, it can be costly if trials are not calculated, and small in scale. If you find a plant that you like, but it isn’t zoned for our climate zone, try it in a protected spot, and be sure to get it planted well before chance of frost to ensure a strong root system before going dormant for the winter. If you see a variety that you like that requires “excellent drainage” try raising or berming an area to create this unique environment while adding some new interest to your landscape. These five ideas will yield successful results when trying to establish your new plantings and as always we at Old Valley Nursery are here to help out in all of these and any other situations you encounter. Come visit us at the nursery as well as our website for more information and to see our great selection of plants just waiting to come home with you.